Thomas was born in Newbury in 1886 the eldest son of Silas Newman and his wife Eliza née Randall. He had one elder sibling, Frances Isabella (born 31 October 1882) and six younger siblings: Henry Montague (1888), Beatrice Eliza (1891), Jessie Mabel (1893), Sidney Silas (13 July 1895), James Ewart (22 August 1898), Edward Charles (10 March 1901), Lilian Beatrice (1907). Beatrice died tragically young in 1902 and there were two further children who died soon after birth: Laura (1885) and Olive Mary (1903). 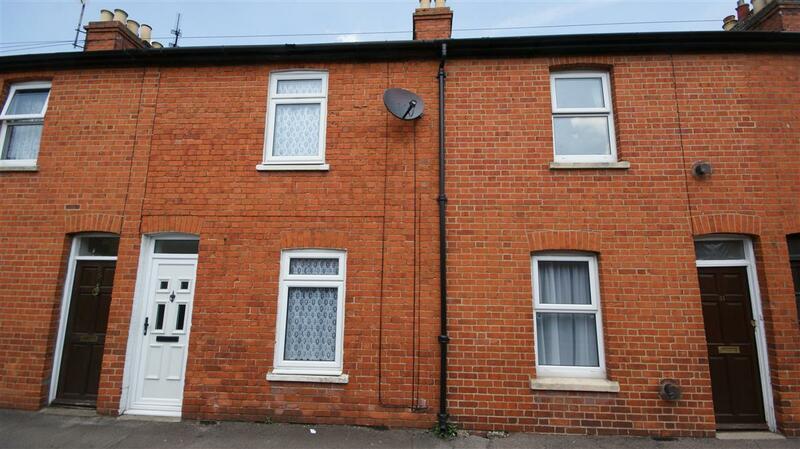 The family was living at St Mary’s Terrace in Speen at the time of the 1891 census, but moved in 1894 or 1895 to 8 Wellington Terrace, Russell Road, Newbury (now 53 Russell Road). Silas was a bricklayer, which may have given him the contacts to get Thomas his first job as a surveyor’s assistant. In 1909 Silas had died aged 48, leaving Eliza to care for the younger children with the help of their elder siblings. It seems that Thomas decided that the building trade, was not for him and instead became a groom. 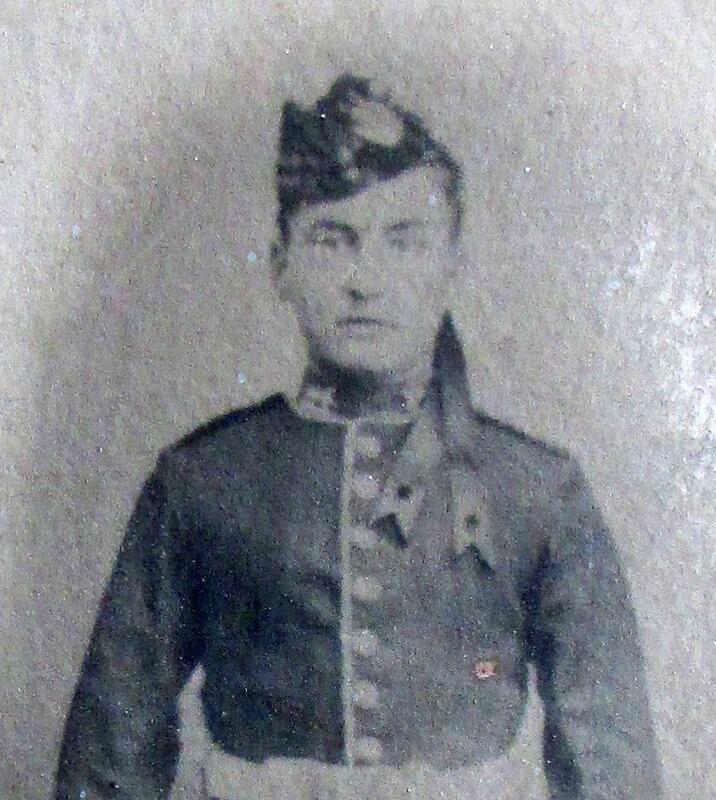 In January/February 1904 he joined the army, enlisting in Newbury with the Scottish Rifles (Cameronians) - a strange choice for a Newbury lad? His service record was among the many lost in a fire during WW2, but his family still has a copy of his discharge paper - which includes a physical description of Tom; he had a fresh complexion, brown eyes, dark brown hair and a tattoo on his left forearm. 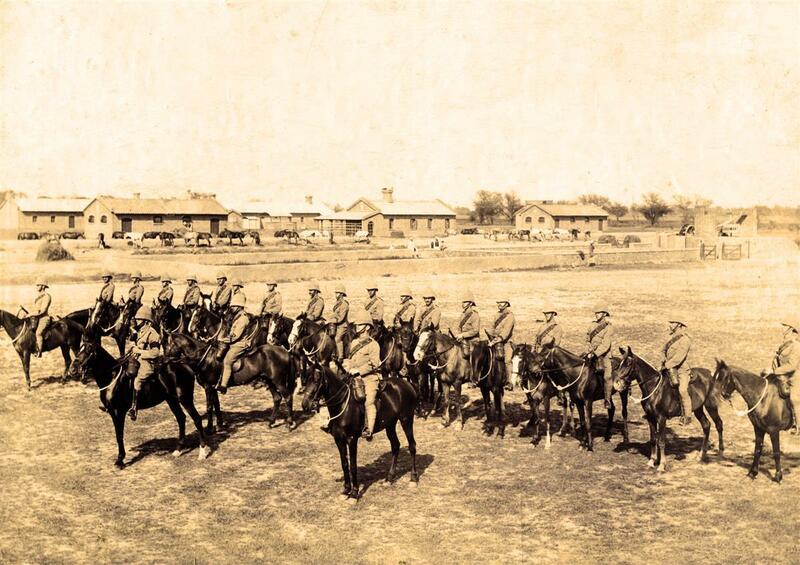 After some training he was sent to join their 1st Battalion in India where, as a former groom, he was a natural choice to became a member of their mounted infantry. The use of mounted infantry was developed during the Boer War when the ability to deploy infantry quickly over all terrains was vital. However, a cavalry dominated high command saw the mounted infantry more as incompetent cavalry than mobile infantry and the idea was dropped. The role was, in part, replaced by rearming the cavalry with rifles rather than carbines and training them to shoot and act as infantry when required. A move that proved very successful and helped save the BEF in 1914. After seven years service Tom was discharged to the reserve in January 1911. This meant that he would return to civilian life but could be recalled to the colours at any time until he completed his full 12 year enlistment. This was the common process, the conditions of service often being referred to as 7&5 (7 years in the colours, 5 in the reserve). He returned to Newbury and found work as a groom at Glendale Lodge, on the Andover Road in Wash Common. It was around this time that Glendale Lodge began to be used as accommodation for the staff of the larger house, Battledene (Capt Partridge), next door. A 1912 directory gives the resident of Glendale Lodge as S Smallridge, gardener - suggesting that Smallridge and Tom may have been Battledene staff. The Smallridge family remained in the area for several generations, running a market garden then garden centre a little further down the Andover Road. Battledene and Glendale Lodge were demolished to make way for a large housing development, the principal road of which was named Glendale Avenue. It was while working there that Tom met Rebecca Ford, originally from Derbyshire, who was in service with the same employer. The two hit it off and married in 1912. They moved to Tynewydd, South Wales, where their first child, Beatrice was born in early 1913 and, sadle, died aged only 7 months. It is difficult to see what attracted a groom to Tynewydd, a mining village in the Rhonda. Tom's photograph in an ornate memorial mount remains a treasured family heirloom (click image to enlarge). 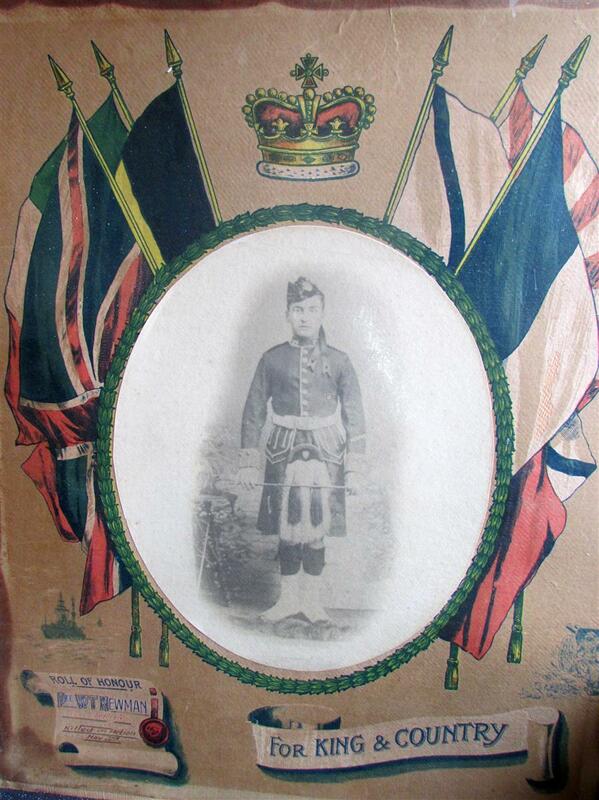 On 4 August 1914, when war broke out, Thomas would have been called up to rejoin his regiment. At about the same time (July-September) Rebecca gave birth to their second child, Lillian. When he left Tom was either leaving a heavily pregnant wife or a new baby. However, he had little choice in the matter and he was with the 1st Battalion when it crossed to France on 15 August. By October 1914 the British Expeditionary Force (BEF) in France and Flanders had grown with the commitment of troops originally held back in the UK, the addition of men recalled from garrison duty around the Empire and even with two Divisions from the Indian Army. However, even with these reinforcements the BEF was still small in comparison to the German forces it faced. On 19 October the Allied line from Switzerland to the North Sea was completed when Belgian forces took up positions near Dixmude. This was not the sophisticated trench line of later in the war, in many places north of the Franco-German border it was little more than a sequence of improvised defensive positions. On 20 October the Germans launched a fresh offensive aimed at breaking through the Allies’ defences; the men of the BEF faced an onslaught, known to history as the 1st Battle of Ypres, which almost overwhelmed them. The 1st Cameronians were soon pushed forward as the reserve battalion behind the other three battalions from their brigade (19th Brigade, 2nd Division) who were manning a line between La Maisnil and Fromelles. The Germans attacked and drove the brigade back a short distance to a hamlet called La Boutillieres. The 1st Cameronians held the line there until relieved on 14 November. During this time the battalion fought off several attacks and suffered frequent shelling, mainly from the shells known as Black Marias. Tom's grave at Trois Arbres Cemetery with the regimental badge of the Cameronians. Shelled rather heavily all day – quiet night. Draft of 1 officer (2/Lt Gordon) & 40 men arrived. Casualties 1 killed, 6 wounded. Tom may have been one of these six, or he may have been wounded a day or two earlier. He was taken from the battlefield to the 19th Field Ambulance at Linen Farm , Bac St Maur only 5 or 6km to the north of La Boutillerie. Field Ambulances were not ambulances as we understand today, they were units of over 200 men that operated forward medical facilties - from stretcher bearers to advanced dressing stations to main dressing stations (such as at Linen Farm), as well as providing the transport to Casualty Clearing Stations (field hospitals). Tom died at Linen Farm, which was probably the Main Dressing Station for his Division and was buried in the adjacent Linen Farm Cemetery. Newbury Weekly News, 3 December 1914 – Killed in Action. 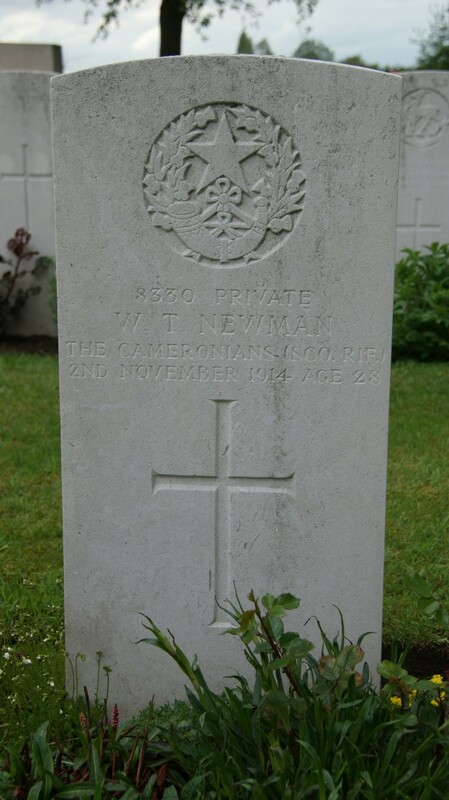 NEWMAN – Nov 2, died from wounds received in action, Pte William Thomas Newman, Cameronian Scottish Rifles, eldest son of the late Silas and Eliza Newman, of Wellington-terrace, Russell-road, Newbury. After the war the Linen Farm Cemetery was one of the many small cemeteries ‘concentrated’ into larger cemeteries. There were a number of reasons for this, some cemeteries were simply deemed too small to make it sensible to maintain them, others were on land that the landowner was unwilling to lose, and others were in unsuitable locations. Linen Farm may have been one of this last group; its location is often waterlogged. Tom’s remains were moved to Trois Arbres Cemetery, Steenwerck where he now lies in grave III.N.6. 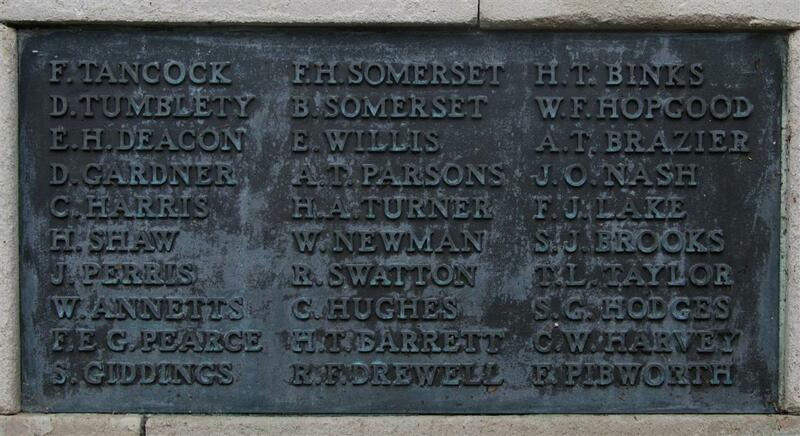 Back in Newbury he is remembered on tablet 13 of the Newbury Town War Memorial. 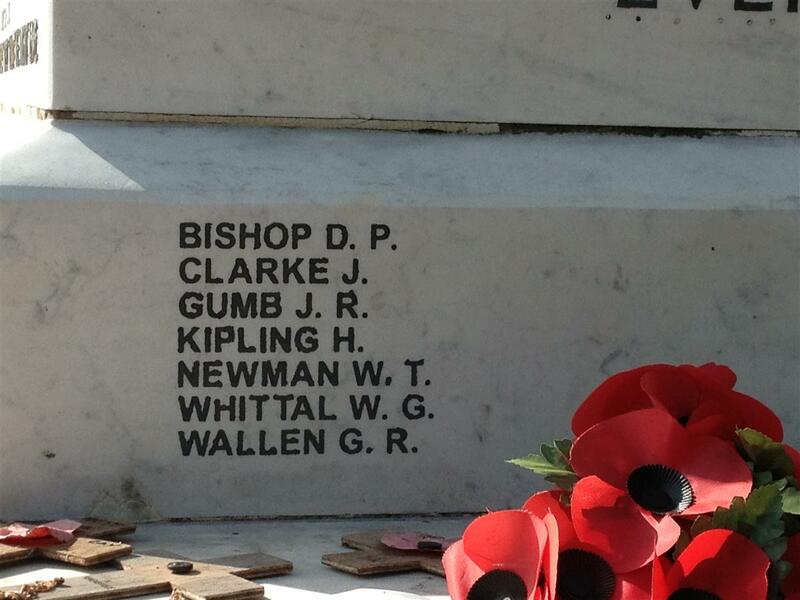 The names, including Tom's added to Staveley memorial in the 1990s. Tom is also remembered on the war memorial in Staveley, Derbyshire where his wife Rebecca settled with their children. Although the memorial was initially limited to men who were residents of Staveley several names, including Tom's were added in the 1990s when the parish council decided to add those whom research showed had a connection with the town. Thanks to Karen Newbury for her help researching this soldier; to Ann Lucas for her help with the Staveley memorial; to Ian Abernethy for the photograph of the Cameronian mounted infantry and, especially, to Tom's great-grandson, Mark Weston for the photograph of his ancestor and Tom's discharge papers.